We are open as normal over the holiday period except for Good Friday, April 19th. We will be open Midday to 6:00pm. 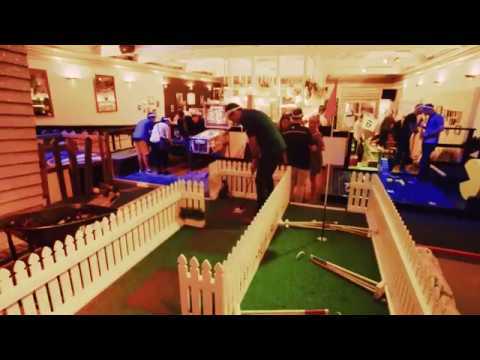 Perth, are you ready for a new mini golf experience? You’ll head on down to Hogwarts and shoot some pars with Harry Putter, but not without passing by Bikini Bottom to say hi to everyone’s favourite under-the-sea sponge. Book now to make sure you’re one of the first to test ‘em out! Want a sneak peek? Check out at some of the new holes hitting Northbridge! Do not collect $200. Just putt your way around this life-sized Monopoly board and make sure you don’t end up in jail. Nothing like a morning of tee and bikkies at nan’s. Guide your way around granny’s gadgets and, uh, putt your way into her bedpan. Okay, let’s get to the point. What's the deal with alcohol at Holey Moley Northbridge? The rumours are true. We have a fully licensed bar and a delicious list of cocktails. You ALWAYS need your ID to enter our Northbridge venue and they will be scanned as of 5pm (Even if you think you are too old, this also applies to you). How do I book Holey Moley Northbridge? Can I cancel or change my booking for Holey Moley Northbridge? How long does the golf stuff take at Holey Moley Northbridge? What if I wanna bring the whole squad to Holey Moley Northbridge? Can I bring the kids to Holey Moley Northbridge? Where do I park at Holey Moley Northbridge? The carpark at 121 Aberdeen St is the best place to drop your buggy. Can I just turn up to Holey Moley Northbridge? How do I get to Holey Moley Northbridge on Public Transport? Jump on the train and hop off at either the Perth Underground or Perth Station, which are both 10 minute walks across from us. The Western Australian public transport journey planner, found here, can map your journey out for you! Do I need to bring my ID to Holey Moley Northbridge?